I’M SURE IT’LL BE OKAY, RIGHT? WHAT’S THE WORST THAT COULD HAPPEN. Two weekends ago, I skated at my first competition in two years, which was also my first competition at the Silver level. It was a chance to put the program out there and get feedback before Sectionals (ack! It’s Sectionals week already! ), and also my first encounter with IJS scoring. The competition itself went… okay. I didn’t fall, I got credit for all my elements, I didn’t have a disaster skate. The scoresheet felt fair. It didn’t feel like a good skate, though, and I felt shaky throughout, like I didn’t have my blades in the ice. There were a LOT of ladies in Silver freeskate, and most of them were very strong skaters, so I wasn’t expecting a high placement; it was more about seeing the numbers for the first time and seeing where I stood. Spins are where I need a lot of work, because my nerves completely wrecked them. My first element was a back camel (CSpB), which I managed to do but not very well, hence all the negative GOEs. The last element in the program is my camel combo spin (camel-sit-back upright) and the biggest source of stress for me; the week leading up to the competition, I lost my camel spin entirely. Aside from being hit or miss on the camel, I was struggling to hit a low enough sit position (shaky camel = no speed into position change). In the competition, the camel got credit but the sit didn’t count so I lost value on that spin (CCoSpBV). I’m generally okay on my jumps, although I did mess up my 3-jump combination by not adding the third jump. At least I still got credit for the first two jumps in the combo (flip-loop). Unfortunately, both my lutzes got edge calls, and fixing this will be a long-term goal. My coach thinks my lutz is a good jump for me despite the potential edge call, so we’re keeping two lutzes rather than replacing with salchows. We’ve been working on getting on the proper edge, but know that I may get called on it for now. GOEs. It’s a little shocking to see so many negative numbers everywhere! It’s a bit of a blow to the ego to see that everything you did was deemed poorly done. 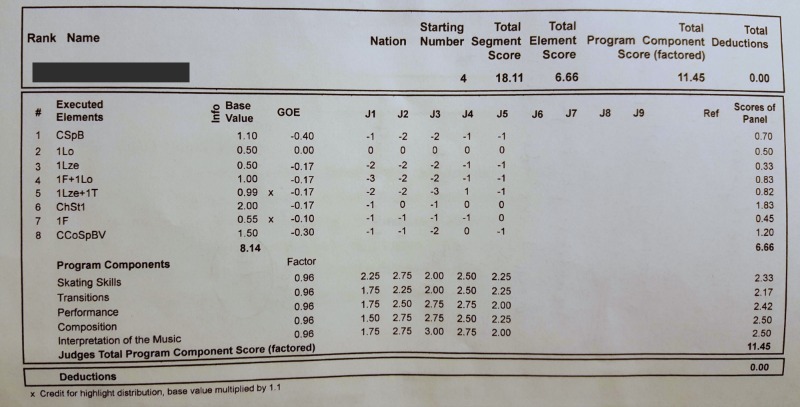 My loop jump was my strongest element, which got a row of zeroes, and my coach was pretty happy about that. So I think I just have to recalibrate my expectations on GOE — zeroes on everything would be amazing! Last year was kind of a big question mark for me, skating-wise, so I can’t say I had defined goals or even plans — I was just glad to resume skating again after being out with an injury, and relieved when my skills started to come back. I also went coachless for the better part of the year, and skipped competing and programs altogether, so it was only fairly recently that I started to look forward with concrete goals again. Compete my silver free skate at Adult Sectionals. I have no idea how I stack up against the field so my goal is purely personal: skate everything clean and get credit for every element. Go to Nationals. I’ve wanted to go every year but something always came up (or I decided against it at the last minute because of the expense), but I have my eye on going this year. Fingers crossed I can manage the scheduling! Practice the axel. I’m not aiming to land the axel, but I know that there’s zero shot of that ever happening if I don’t even attempt to practice it! I have padding and guards and I feel like I’m ready to move on from prep drills, but I have a hard time mustering the courage to actually practice it. That said, I also need to be careful about axel practice, because I was recently attempting them and tweaked something in my bad hip (that I had surgery on). It’s hopefully a minor thing, but it scared me into remembering that I’d rather skate forever without an axel than to reinjure myself, require more surgery, and have to quit skating! I haven’t figured out where the line between challenging myself and being protective/careful is, because I’m not ready to give up on axel hopes yet. But I will if it comes to it. Test Intermediate moves in the field. I’m not in a rush to pass tests, but Intermediate has several overlaps with Gold, which I passed, so only 3 new moves to learn. I think getting this sometime this year is a reasonable aim. Get 3 revolutions in a flying back camel spin. I’m making good progress on the back camel, but currently I’m at the 1-revolution-and-fall-out phase of the flying version. Level up the spins. My coach was going over all the spin possibilities for my Silver program, and it’s kind of mind-boggling all the combinations and variations that give you levels. I feel like a Level 1 would be within reach; Level 2 is a stretch goal. I’m now a Silver skater! Phew! Every time I test or compete, in the lead-up to skating I ask myself why I do this and what it brings me when it makes me feel so nervous and stressed out. But then I do the thing, and even if I don’t pass or do well, I usually feel fine the second I finish, even exhilarated. I tell myself consolingly that I don’t have to test or compete at all, that skating for its own sake is plenty rewarding, but then the thought of not testing or competing bums me out. So I continue to do it! Preparation for this test was a little rushed, because my new coach and I have only been working together two months and the program is very new. But because of the timing of the tests offered, we decided somewhat last-minute that it would be better to test early rather than wait till late January, and we put together a basic program with just the test requirements. I don’t have video, sadly. Every time I test I think about asking someone to video me, but at the last minute I get so nervous that it feels like knowing I’m on video would add too much anxiety and I opt not to do it. And then afterward I wish I’d gotten it. Ah, well! I generally felt prepared going into the test — I actually cut short my last few practices, because I felt like I had everything where they needed to be, and I didn’t want to overthink things. My camel spin has been behaving lately, and I’ve been getting the feel for it, and my jumps felt comfortable. As long as I didn’t blank out or get too nervous, I felt I would be okay. Of course, nerves are always the big variable. I felt low-level nerves while waiting and my warm-up went fine — a little shaky but calmer by the end of it. It wasn’t until I actually began the program that the extra bit of nerves hit, making me a little jittery. It didn’t derail me in a significant way, but my coach and I agreed that all the jump landings were more skittery than usual. Partly because I didn’t have as much speed as I’m used to, and partly because I think my knees don’t bend when I’m nervous! The one outright mistake came on the solo camel spin, which didn’t get a good entry (my coach said my entry didn’t get the power it needed in wind-up) and I barely hung on. I think I got a little more than 2 revolutions and was prepared to reskate it. But then I hit my camel-sit spin combo later, so I think that’s why I didn’t get any reskate requests. Everything else was completed, if not as well as I usually do in practice. Gah, nerves! I didn’t use to understand why TV commentators would talk so much about nerves and call skating a mental sport, but now that I skate, IT’S ALL MENTAL. Camel – work for clear exit – stronger. Loop ok. Lutz – work on entry edge. Keep working on knee bend. Keep working on lower sit pos. Some nice elements in presentation. Good. Make sure to hold camel for required revs. Good flow. So that’s two tests down this year! Which is one test more than I had dared to hope earlier in the year. Just for fun, some stats: It’s been four months since my last test (Gold moves), nearly two years exactly between passing Silver moves and Silver freeskate, and about 3 and a half years between Bronze free and Silver free. I don’t intend to test for a while yet, but I’m thinking Intermediate moves will be ready much sooner (within a year?) than Gold free, which I’m not even going to think about — I’m going to enjoy skating Silver for a while! My coach explained the importance of spins once hitting Silver, since some competitions start judging with IJS rather than 6.0. And given that I’m unable to land double jumps but could, theoretically, hit a Level 1 or 2 spin, the spins end up being bigger point-getters than jumps, although there are only 2 spins allowed versus 5 jumping passes. But then on the downside, if you don’t quite get a leg high enough or low enough, or hold a position long enough, the dreaded dash of doom could zero out the whole attempt. So all in all, I’m putting a lot of attention on my spins these days. It’s been a while since I’ve videoed my jumping, but I guess I’m not that excited about my jumps (other than dreaming of an axel someday) — I generally have all my singles now, and they’re dinky adult jumps so there’s definite room for improvement, but somehow it feels like there’s less to work on. Whereas, there’s an endless number of spin variations. I have trouble with the traditional layback position, and it’s something in the right hip and leg that I haven’t figured out yet. I can see the problem in the video, but it’s still a struggle to get it corrected. I tend to lean to the right and I don’t think my hips are pushed far enough forward, and when I try to correct my hips my right leg sort of dangles. We tried tweaking the layback position to lean intentionally to the right, and that seems to work better. Right now it’s just an upright/attitude spin because I’m not really leaning back, but it’s a goal. For the back camel, we’re playing around with position changes. Possibilities: back sit, crossing my free leg on my spinning knee, or going into a cross-under backspin. The goal is to be able to get 4 revs on the back camel (to leave margin for error so I get credit for the position). Sit spin to broken leg may be an option. I feel stuck in the broken leg position, and I can see there’s a lot of space between my chest and my knee, and it looks like the best broken leg spins are when the chest is all the way down and nearly touching the knee. I’ve tried it a couple times and it’s freaky! Also incredibly dizzying. Back sit to back tuck. This is unlikely to be a candidate because it’s an awkward transition. As soon as I tuck the free leg, I hit my toe and grind to a halt. I’ll keep working on it, but I’m not getting the hang of this. That cross-under spin (? is there a real name for that?) is so pretty when I see other skaters do it, but it’s a ways off — most often it dies after a revolution or two. I doubt I’ll end up using it in a program anytime soon. And, last but not least, the good ol’ camel-sit-back sit. The struggle, as always, is hitting the camel. It’s a fickle beast!